Red or Blue? Choose your side and experience the trip of a lifetime! Are any of your friends or family massive Manchester United or Manchester City fans? If so, we've got the ideal gift for them! Flying from City Airport Manchester (Barton), The Reds Experience 20-minute/33 miles helicopter ride tracks over some of Manchester’s famous landmarks, including Manchester United’s training ground and culminates in a flyover visit to the world-famous Old Trafford, home to the most successful club in English football history. 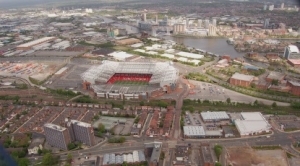 The scene of some of the most memorable games in football's history, Old Trafford is a real sight to behold from the sky and flying over it by helicopter is an experience any Man United football fan should forever remember. For more details on the flight path The Reds Experience takes – including unrivalled views of Old Trafford Cricket Ground (the famous home of Lancashire County Cricket Club since 1864 and one of the world's most beloved Test cricket grounds), Salford Quays and The Lowry Hotel – click here. But what about if you're a Manchester City fan? Well, then, you'll want to take The Blues Experience, offering an unrivalled view of the Etihad stadium, home of the current Premier League champions (for now, that is!). 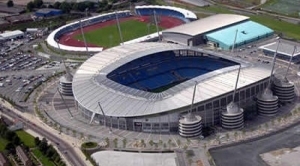 helicopter ride tracks over the famous sites of England's second city, culminating in a flyover visit to one of the world's finest and most opulent modern football stadiums: the Etihad. Home to the 2011/12 and 2013/14 season Premier League Champions and five-time FA Cup winners. For more details on the celebrated Manchester landmarks you'll see on The Blues Experience – including Imperial War Museum North and Media City UK; the Manchester Ship Canal; Trafford Park (the world’s first planned industrial estate and currently the largest in Europe); the impressive Intu Trafford Centre; and the longest real snow indoor ski slope and resort in the UK – click here. So, whether you're for the Reds or the Blues, we can offer you an experience you'll never forget! Please note that the flight path and order of landmarks en route may vary due to the wind direction or be curtailed due to Air Traffic restrictions on the day, as this flight takes place in controlled airspace – we cannot go where we want, when we want!